A new power system from Steelcase transforms any carpeted floor into a power-ready space. The Thread power system uses an ultra-thin modular track designed to be laid under carpet in existing structures, eliminating the need for trenching or coring. The track attaches to a low-profile connector and a standing power hub or adapter. The entire setup is a one circuit, 20 amp system with enough power to support laptops, mobile devices and powered furniture. Each power hub provides six standard outlets at standing height. 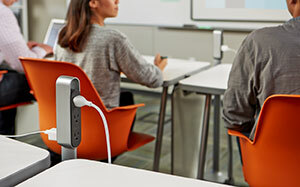 For easy reconfiguration, the hubs can be moved to a different connector throughout a space, or anywhere within a 5 foot radius from each connector. "Access to power in many workplaces and education facilities remains scarce. In our research, we saw workers choosing uncomfortable places to work and study simply to gain access to power for their mobile devices," said Jan Carlson, general manager, architectural solutions for Steelcase, in a press release. "If power was always within reach, people could create, problem solve, focus and recharge anywhere." For more information, visit the Steelcase site.